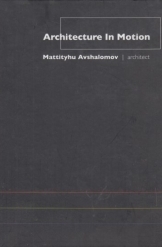 Architecture in Motion by Mattityhu Avshalomov, Israeli architect, this book is in English. This book is an example of the author's philosophy of life how architecture is part of living and how living is part of architecture. Includes plans, ideas, making sense, where to start, where to go, limits, rules, control, thought, home and much more.